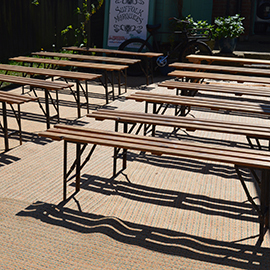 Vintage bench and table hire ideal for retro and festival style weddings and events. 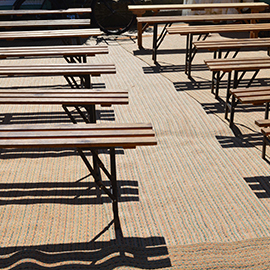 Our new (old) vintage benches are ideal for classic retro chic wedding and events. We have fantastic prices for hire across Suffolk, Essex, Norfolk and London. The classic folding benches are are all original and have the industrial look about them. Ideal for inside or outside use for dining or ceremonies. Each bench can accommodate 3 or 4 guests. Our reproduction classic trestle tables are ideal for banquet style wedding and work beautifully with our original benches. If you would like a quote please call Michelle in our Ipswich office. 01473 603310. We have just taken delivery of our first batch of benches so I have taken a few images at the office when we have some better images at weddings and events this summer i will update the images.